Usually, when I get a call from a stranger who asks for someone else and I say, "Sorry, you have the wrong number," the person on the other end of the line just hangs up on me, showing off their excellent social skills and phone manners. 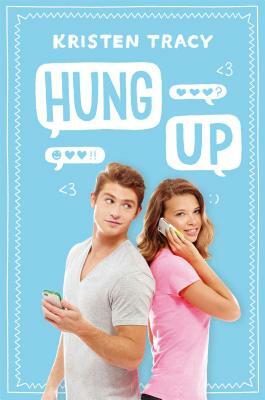 I'd rather have the experience shared in Kristen Tracy's new novel Hung Up, where a wrong number leads to a really cool friendship. Lucy calls what she thinks is a trophy place and leaves a brief message. She doesn't get a response. A few days later, she calls and leaves another message. No response. Another call. No response. Naturally, she grows increasingly frustrated with each call. Two weeks later, someone finally picks up when she calls - only it's not the engraver. It's James, a guy Lucy's age who got a recycled number from a phone company. He apologizes for the confusion and wishes her luck tracking down her order. A week later, James calls Lucy and leaves her a message. Over the course of the next two months, the teenagers keep in touch. At first, they communicate solely over the phone, without meeting face-to-face. They become friends and share funny things that happened to them during the day as well as more personal anecdotes. Sometimes, you just need to hear the voice of someone that cares about you - and sometimes, you just need to be heard. Instead of using your typical narrative form, this story is told in a series of voicemails and phone conversations, making for a quick read. With only two characters speaking, you really see (and hear) the world through their words, because all you have to go on is what they say. The dialogue is great, very snappy and fun. There's serious stuff there, too. The book ends at the perfect moment. I'd compare that moment to a similar moment in another book I read recently, but that would give too much away. I enjoy Kristen Tracy's books because they are always full of dramedy, and I love dramedies1 because that's what life is, a mix of comedy and drama - and that's what Hung Up is. And it's great. So you should read it, and we should talk about it, okay? Give me a call later when you're done. 1. Ask me about the TV show Leverage sometime. I really love that show. Review originally published at Little Willow's blog, Bildungsroman.